Babine Lake Marine Park – Pinkut Creek Site is one of six sites that comprises Babine Lake Marine Park. These sites all lie along the shores of Babine Lake and include Pendleton Bay, Hook (Deep) Bay, Smithers Landing, Pierre Creek, and Sandpoint sites. The sites provide anchorage, scenic lakeshore viewscapes, beaches and fish-bearing creeks and provide access to internationally-significant fishing opportunities along 200 km of waterways on the largest natural lake entirely within BC. The Pinkut Creek Site is adjacent to the Pinkut Creek spawning channel, and includes a small, rustic, road accessible campsite in a bay. The Pinkut Creek Site is in a wilderness area that is frequented by bears. Visitors are required to keep a clean campsite and should be familiar with bear safety. The Pinkut Creek Site is located on the shore of Babine Lake, northeast of Burns Lake. From Burns Lake, follow Babine Lake Road north of Burns Lake for 20 km. Turn right onto the Augier FSR and follow this for 9.9 km and turn left (at km 26) onto the Grizzly FSR. Follow the Grizzly FSR for 2 km and turn left (at 28 km) onto Fisheries Road. Follow the Fisheries Road for 14 km and turn right, following this spur road for 1.1 km to the park campsite. Culture: The small marine sites lie within the asserted traditional territory of the Ned’u’ten Nation, Carrier Sekani Tribal Council, and the Yekooche First Nation. Approved Management Direction Statement [PDF] for Babine Lake Marine. Boating is popular on Babine Lake and the Pinkut Creek Site provides a good launching and landing site for people wishing to visit the southern end of the lake. Visitors in small boats should use caution as large waves can develop without warning. The park is open to hunting. Please consult the Hunting & Trapping Regulations Synopsis for more information. Swimming in this large lake is usually limited to the warmest months of the year (July & August). 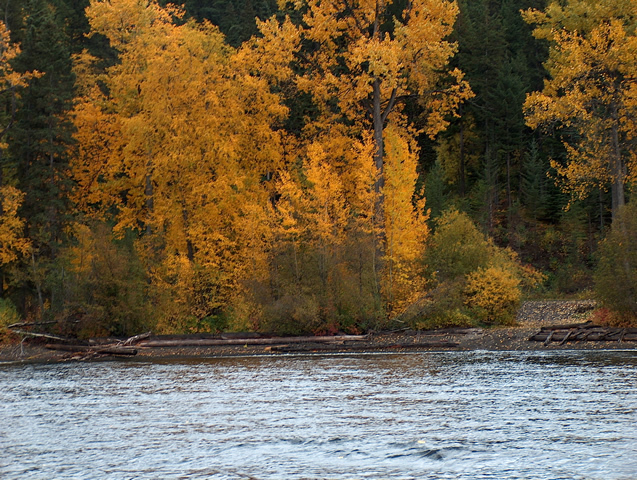 This site provides great opportunity for viewing eagles in the fall during the salmon spawning season. There is a rustic gravel boat launch at this site and ample room for parking. Campfires are permitted. If you chose to have a fire, please bring wood with you. Collecting firewood in the park is prohibited. This park offers vehicle accessible campsites on a first-come, first-served basis; campsite reservations are not accepted. A small clearing next to the bay provides space for vehicle accessible camping (roughly 5 units) in the snow-free season (May through October). Bring your own drinking water, as potable water is not available in the park.